Local history, Local stories... George Augustine Taylor memorial. 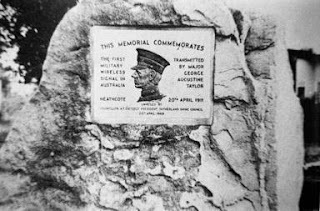 On the 20th of April 1968, Councillor Arthur Gietzelt unveiled a memorial at Heathcote's Veno park to commemorate the transmission of the first military wireless signal in Australia by officer George Augustine Taylor exactly 57 years earlier. George Taylor (1872-1928) was certainly an extraordinary man. His occupations included journalism, architecture, town planning and cartooning. He is also credited with achieving the first flight in Australia in a heavier-than-air flying machine. Although Taylor organised the Heathcote experiment it was three civilians who were experts in wireless, Walter Hannam, Edward Kirkby and Reginald Wilkinson, who successfully transmitted the signal, thereby demonstrating the potential of military wireless telegraphy that would be utilised during World War1. As Taylor himself stated "Consider what this will mean!" Do you have something to add to this story? Contact the Local Studies Librarian on 9710 0225. To find more historical photographs of the Sutherland Shire visit sutherlandshire.nsw.gov.au/history.